"Have a campus project? Look out for trees"
"Budgets dwindle, but master planning goes on"
"Renovation ensures a campus hub for years to come"
"In new WSU dorm, each floor is a neighborhood"
"Veterinary medical building: a melting pot for research"
"Historic warehouse gets an academic makeover"
"UW's Foster business school built on connections"
"UW ramping up $833M housing plan"
This list represents campus projects that are planned or under way. Cost estimates, with one exception, reflect the total project budget. Start and finish dates are for construction only. Budgets and time lines for future projects are projected and may be revised. 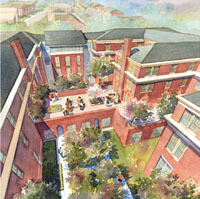 This list represents campus projects that are planned or under way. Cost estimates reflect the total project budget. Start and finish dates are for construction only. Budgets and time lines for future projects are projected and may be revised. 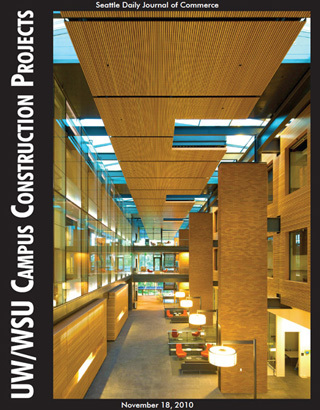 Paccar Hall, the $95 million home of the University of Washington’s Foster School of Business, opened in September. It’s the first phase of a two-building complex, designed by LMN and built by Sellen Construction, that will be completed in 2012.